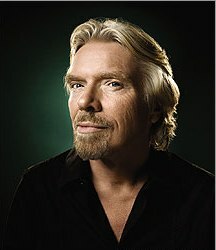 Richard Branson is the founder and chairman of Virgin Group of companies. He runs some 400 companies under the Virgin umbrella; and has the presence in almost all the markets of the world, whether it is Music, Railways, Airways, Finance, Health, Mobile, Beverages, Cars, Books and various other sectors, Virgin brand is their. The multi billion dollar businessman believes in having small-many businesses rather than one big business. His theory is bit complicated and much criticized by management experts. Off all the claims and criticisms, he stands tall and do things that challenge the very set and unquestionable-conventional rules of the world. Reading his biography made me realize why he likes challenging the rules? After all he is the first man on earth who has traveled the Atlantic Ocean on a hot air balloon. He is not a sportsman neither has any deep interest in balloon riding, but the very idea that it is risky and adventurous and can even take his life, inspired him to embark the journey. Right from his childhood, Richard is infused with one peculiar quality of taking risk (and facing challenging situations) – This characteristic of him can be seen in all his business ventures. He is into various markets which are strictly no-no and where big daddies of business get afraid to get in. You would be surprised to know that Richard is dyslexic; when he was child it was difficult for him to read and write. Yet at the very young age of 16, he started his first business venture, a magazine called “Student”. He is freak, a maniac, a daring personality and a go-giver. He likes to play against challenges and rise above them. He has never bothered about people, how would they feel and what do they think, is it right or wrong, this is his idea whether it his personal life or business, he says, If I come across a particular business which is not run properly, and if I think, that I can do it better, I just go for it. One best example of this is his Airline Business, he found that airline companies at that time where not listening to customers, it was like customers saying “We are working for you”. The feeling quite struck Richard and inspired him to start his own airline company that would keep customers at center. Interestingly, Richard started his airline company with a single plane. He bought the plane on lease from Boeing on a one year agreement. His idea was to take a calculated risk. He says if at all I would fail I had nearly nothing to lose, just the six months of profit from my record business, but if I succeed then you know, what I am gaining. Richard believes in taking risks to survive. He believes in doing something rather than nothing, he says, if you do something theirs a possibility to make it happen, but if you seat back and relax you have every reason to lose. It is said that Richard has lost more money than making it. Wise enough, he is still one of the richest men on earth. Cheers to Richard Branson and his impressive lifestyle. Video: Watch Richard Branson talking about his journey from a dyslexic high school dropout to one of the world’s richest men.